Herbert Broennle was born on 25 December 1920 at München-Pasing. On 1 September 1940, Broennle was posted to 2./JG 54. He gained his first victory on 23 June 1941, over the Eastern front, when he shot down a Russian SB-2 twin-engine bomber. Broennle claimed three Russian SB-3 twin-engine bombers shot down on 6 July to record his second through fourth victories. He claimed his 10th victory, another SB-2, shot down on 12 August. On 17 August, Broennle suffered engine failure in Bf 109 F-2 (W.Nr. 5444) necessitating an emergency landing 20km behind enemy lines near Tschertskowad. He successfully evaded capture and returned to his own lines. On 3 February 1942, he recorded his 20th victory, when he shot down a Russian I-16 fighter in the Volkhov area. His victim was the Russian ace Leitenant Ivan Chulkov (9 individual +2 shared victories) of 41 IAP, VVS. He shot down two Russian SB twin-engine bombers on 14 May to record his 29th and 30th victories but was wounded by return fire. His wounds kept him from combat until December. He recorded his 50th victory on 24 January 1943. Oberfeldwebel Broennle was awarded the Ritterkreuz on 14 March for 56 victories. Broennle was transferred for a spell of fighter pilot instructing with 3./Jagdgruppe Süd. On 19 May 1943, he returned to combat duty with 2./JG 53 based in Sicily. On 2 July, he shot down a USAAF B-24 four-engine bomber for his 58th, and last, victory. On 4 July 1943, Broennle engaged in aerial combat with RAF Spitfires. His Bf 109 G-6 (W.Nr. 18 430) “Black 8” received hits in the engine over Catania. He attempted to return to his base but the engine seized and he crashed vertically to his death to the north of Lago Lentini. It is thought he may have been shot down by New Zealand ace Squadron Leader Evan “Rosie” Mackie (21.5 confirmed, 2 probable and 10.5 damaged victories) of 243 Sqn, RAF. 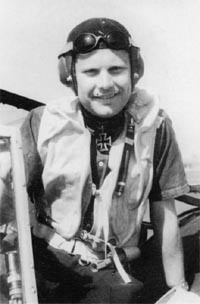 Herbert Broennle was credited with 58 victories in 387 missions. Broennle recorded 57 victories over the Eastern front and at least one over the Western front.